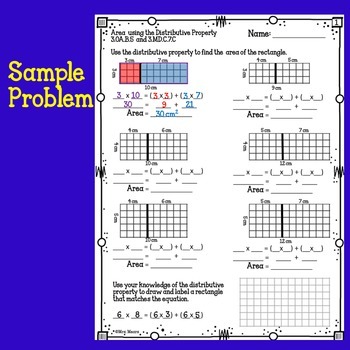 This product helps you teach the concept of Area using the distributive property of multiplication. I have found that students are more successful with this complex concept if they have repeated practice over several days. 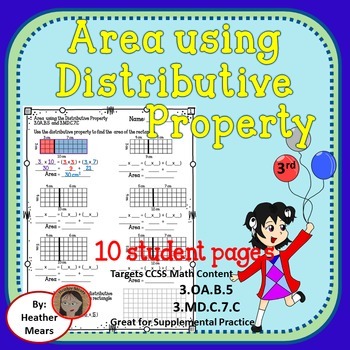 The one or two days provided in core math curriculum is insufficient for students to gain a working understanding of the Area using distributive property concept. This product contains 10 student pages. Five are targeted for use in intervention groups. Five are for use for the on level group of 3rd graders. I have the students use crayons to color code the different rectangles that make up the larger rectangle. This helps them see the relationship between the rectangles and the equation. This is intended for use by 1 classroom. If you are purchasing for your grade level team please purchase multiple licences at a discount.